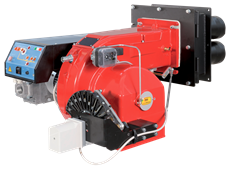 TECNOPRESS burners cover a wide range of applications from 332 to 2150 kW and are suitable either for heating generators with high back pressure or suction in combustion chamber. This series represents the highest expression of our experience on gas burners. The combustion head “bell shaped” is able to produce high performance flame. The practicality of all set-up devices together with an easy maintenance procedure and a high quality/price ratio make this product very competitive. For efficient combustion and good mixing between gas and air, the position of the combustion head can be modified backwards and forwards by means of a screw adjustment. In addition, an adjustable cam driven by the modulating motor allows a smooth transition from low to high fire. A circuit board with pre-wired plug connections, inside the control panel, ensures correct wiring in case of maintenance.